External 3.5″ SATA USB 3.0 enclosure #3DThursday #3DPrinting « Adafruit Industries – Makers, hackers, artists, designers and engineers! 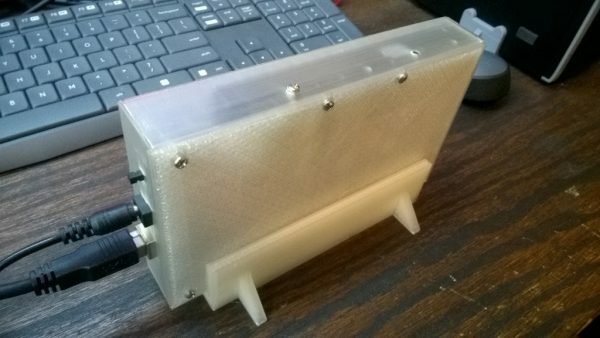 This is an enclosure for a 3.5 sata HDD and a USB 3.0 adapter. The picture shows that I misplaced the side mounting hole at the rear of drive, but the scad and stl files have been corrected since the print. Just attach the HDD and adapter to the bottom plate. I used a nylon nut on the adater to keep from shorting a trace but a nylon washer or even an o-ring would work. Then slip the top cover over the front first and pull the back down, and attach screws to the side of HDD to secure it in place.